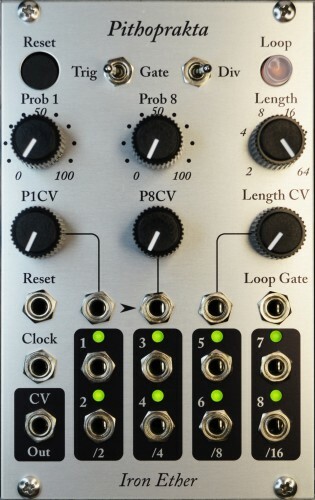 The Iron Ether Pithoprakta is a 16HP module for the Eurorack synthesizer format, which generates new rhythms in real time, based on a combination of randomness, looping, and evolution over time. Nearly all parameters can be controlled by external control voltages or gates. At its core, Pithoprakta has 8 channels of random trigger or gate generation, all clocked by a common clock input. The probability values for channels 1 and 8 can be defined directly, with the Prob 1 and Prob 8 knobs, respectively, as well as their associated CV inputs, each with its own attenuator. The values of channels 2 through 7 are interpolated between these, allowing the user to create a spread of probabilities, and modulate the density levels in complex ways with only one or two external modulation sources. When looping is engaged, the Prob 1 and Prob 8 knobs and CV inputs change from setting the probability of the outputs being on or off, to now setting the probability that a given step of the loop will be over-written on the next step. In other words, they become "probability of change" controls. Low settings will repeat the loop with small changes over time, eventually becoming something entirely different. Pithoprakta also includes a bonus CV output, derived directly from the states of the gate outputs. This CV sequence will loop and evolve along with the gate outputs - useful for things like pitch sequences and random modulation of filter cutoff. When the Div toggle switch is set to the right, Divider mode is engaged. Each output is now clocked by a different division and/or offset of the input clock. From left to right, the columns of outputs are divided-by-two, divided-by-four, divided-by-eight, and divided-by-sixteen. The upper four channels receive odd-numbered clocks, while the lower outputs receive even-numbered clocks. Musically, these correspond to downbeats and upbeats, respectively. "Pithoprakta" is a Greek word coined by avant-garde composer Iannis Xenakis, to mean "actions through probability." The Pithoprakta is available direct from the shop here at ironether.com, and ships worldwide. For European customers, it is also available from Escape From Noise in Sweden.